As we continue to celebrate Hispanic Heritage Month we are sharing another amazing and inspiring book to share with your kids. 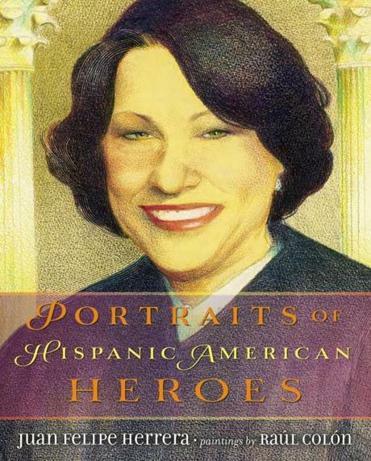 Portraits of Hispanic American Heroes is an amazing book filled with inspiring and influential people. Portraits of Hispanic American Heroes written by Juan Felipe Herrera illustrated by Raul Colon is devoted to 20 important and inspirational Hispanic Americans. Hispanic Americans who have helped shape United States history in some way. With a wide range of influential people, Herrera shares short motivational biographies for each. Including the usual popular picks for people of influence, with regards to Hispanic Americans. Like Cesar Chavez, Sonia Sotomayor and Roberto Clemente. However, Herrera goes one step further. Writing about people from the arts, such as Desi Arnaz, Joan Baez, and Rita Moreno. People from the field of science such as Luis W. Alvarez and Ellen Ochoa. Additionally, the lesser-known figures such as Julia de Burgos, Judith F. Baca, and Ignacio E. Lozano. You could not help by be inspired as you read and learn about each individual and their life and accomplishments. This book is wonderfully written. The short biographies are informative yet engaging and suitable for the intended young audiences. Besides all the wonderful writing, the artwork is stunning and was a discussion piece all on its own. Whether this is read in a school setting or for leisure, this book is a definite hit if the child is interested in biographies. I personally loved learning along with my daughter about some of these individuals which I was unaware of. I also loved the special tribute at the end of this book, for the teacher, Victoria Soto who lost her life protecting her students in the Sandy Hook tragedy. Even though my daughter was aware of why lockdowns occur even though they are frightening to children. I highly recommend this book, especially for Hispanic Heritage Month.